Ella Fitzgerald’s years at Verve, largely under the expert guidance of Norman Granz, remain her most celebrated. Yet only once during that period was she provided the opportunity to record with just guitar. On “Wait Till You See Her,” off 1956’s Sings the Rodgers and Hart Song Book, she can be heard alone with Barney Kessel. But two decades later, when Granz founded Pablo and re-signed Ella, voice-guitar albums featuring the virtuosic Joe Pass became a pillar of her output. Though American, Pass (née Passalacqua) was of Italian descent. 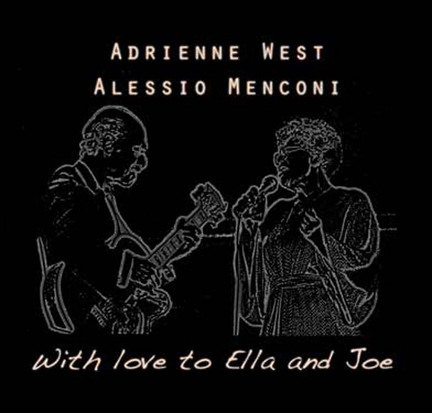 Fittingly, nearly half a century after Pass met Ella, Italian guitarist Alessio Menconi unites with African-American vocalist Adrienne West to pay tribute to that classic pairing. By the 1970s, Ella’s voice was starting to show its age. Though the sessions were beautifully rendered, and she contributes several exquisite performances, it is Pass who shines brightest. Menconi and West are more evenly matched. (West is 63, the same age as Ella around the midpoint of her Pablo years, but her voice has better stood the test of time.) On eight tracks drawn from across the Pass-Fitzgerald oeuvre-plus two odd additions, “Love Dance,” which Pass actually recorded with Sarah Vaughan, and “Pra Dizer Adeus,” which Fitzgerald never covered-they establish an estimable rapport: light, warm and immensely tender. It isn’t quite Pass nor Ella in her prime, but it’s unquestionably lovely.